SHREWSBURY, Mass. -- In its first two games this season, BC High had showed minimal signs of an offense. In spite of some solid pitching, the Eagles had become inconsistent at the plate in the early going, scoring just two total runs. On Saturday morning, with temperatures climbing into the mid-60s, so too, did BC High's bats warm up. Banging out eight hits and driving in runners during key opportunities, the Eagles were able to upend St. John's (Shrewsbury) 4-1 at Pioneer Field. BC High (2-1) showed plenty of patience at the plate against Pioneers' ace pitcher Sean Burke. The future University of Maryland product struggled with his command at times and seemed to get flustered on occasion as his defense did him no favors. Uncharacteristically, St. John's committed three errors, including two during a crucial four-run third inning. As a result, that would force Burke to throw more pitchers than he would have liked. The senior right-hander lasted five frames, allowing seven hits, walking four and striking out eight on 108 pitches. "We had some chances early where we didn't capitalize but we managed to come around later," said BC High veteran coach Norm Walsh. "I didn't think Burke was all that sharp for them today. So we got pretty selective at the plate. We were able to square some balls up and were able to build (Burke's) pitch count up which was key. It's always key to do that against a quality pitcher like him." The Eagles did all of their damage in the third after sending nine to the plate. Marty McCormack opened by reaching on an error and Sean O'Connell roped an opposite field single to left field. 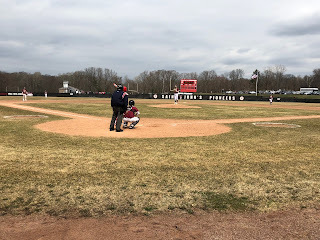 With runners on the corners, Mike Vasil hit a sharp grounder to second that was bobbled by sophomore Nick Carelli, allowing McCormack to come home with BC High's first run. Things continued to worsen for Burke after he slipped off the rubber during his delivery that resulted in a balk sending O'Connell across the plate. A walk to former St. John's player Matt Sullivan was finally followed by an out. However, Burke could not escape further trouble after Luke Murphy turned on an 0-1 fastball down and smacked it down the left field line for a double to plate a pair and put the Eagles on top by four. "Up and down the line up today everyone was hitting the ball all around," Murphy said. "Today was definitely our greatest hitting game so far and the pitching was there for us too. It was a good all-around team effort today." The defending Super 8 champion Pioneers (1-1) managed to get one of those runs back in the bottom of the frame against Eagles' starting pitcher John McDonald. With one out, Bailey Mikule doubled and Burke followed with a single placing runners at first and third. Mikule trotted in a short time later on Matt Livingston's ground out. After a shaky opening frame in which he was able to dance out of trouble, McDonald pitched well during his four innings on the hill. The senior gave up three hits and fanned three before giving way to O'Connell, who surrendered just one hit and K'd three over the final three frames. "John (MacDonald) never seemed to quite get into a rhythm but last year he would've never been able to find it at all," said Walsh. "So today was a big positive for us in what he did. Some days you struggle with things on the mound and you need to find a way to get the job done and I think that's what he did today." The Eagles had a couple of opportunities to add to their lead later in the contest. In the fourth McCormack led off by singling to center. Eventually moving to third with two out, a wild throw down to third had McCormack sprinting towards the plate. Left fielder Tom Moschella made a one-hop throw to catcher Carson Hauben nail McCormack, even though it appeared to the naked eye that McCormack's hand had touched the plate before the tag was applied. In the Eagles' fifth, they loaded the bases with none out. Pinch-hitter Mike Dragon roped a hard liner to Carelli, who immediately threw to first to complete a double play. Nick McDonald then struck out Pat Roche to squash the threat. 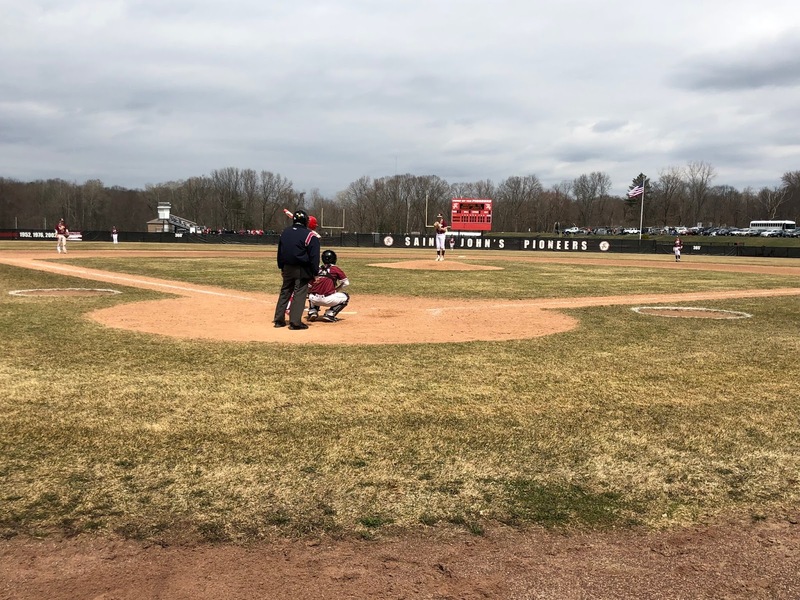 Meanwhile, the Pioneers, having scored 16 runs in their opening day victory over Holy Name, continued to struggle at the plate. After being handcuffed by McDonald, O'Connell was equally as effective by not allowing St. John's to muster any kind of late inning threat. "We can't give BC High five outs like we did in that third," Pioneers' coach Charlie Eppinger said. "Sean was basically forced to throw 38 pitches in that inning. We started the inning off with some defensive miscues which really helped them out. It was basically a one inning game when you look at it. We just need to clean some things up defensively and we need to swing the bats a little bit better. We have a very talented roster here so we need to get better as the season wears on."